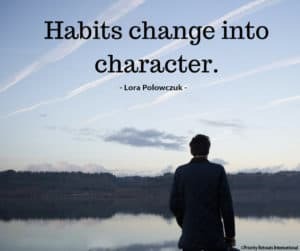 Do Your Habits Propel You Into Success? When you sit down and think about the same routines you do every day, consider this – Do your habits enhance your day or make if it more difficult? Practices begin with how you start your day, from the moment your alarm goes off and how you wake up. Do you jump out of bed, energized to begin your day or do you hit the snooze button and roll over for 5 more minutes? Think about it for a second. How do you feel when you wake-up? Do you wake-up groggy because you stayed up late watching TV or checking the latest social media post or did you get sufficient quality sleep to begin the day? Your morning is directly affected by your prior evening. These small habits turn into how much energy you have for the day. This energy translates into your attitude for the day, the mental capacity you have for projects, and interactions with colleagues partners, or kids. 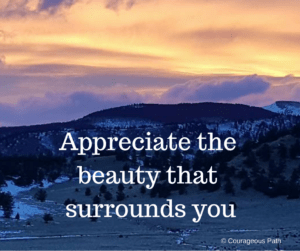 In my own life, I’ve seen how these very small habits can make or break my day. These small habits are not life altering decisions yet they lead to profound experiences and how I interact with others. Case in point. On Saturday evening, I was quite tired after a training day in the mountains and hanging out with new friends. I hit the sack so I would have energy for my 3rd and final training day on Sunday. Yet, I didn’t perform my nightly habits of packing what I need for the next day. As a result, I took an extra 10 minutes in the morning. And, guess what? I was 10 minutes late for my class on Sunday. I was embarrassed to be late and certainly wasn’t proud of myself nor did I want to showcase that this is who I am on a regular basis. What daily habits make you successful for the day? What habits do you need to stop doing to create more success? This constant evaluation of what works and what doesn’t is key to adjusting where you focus your time and how this time serves you. This week find some quite time and take a deep dive into your habits and see where the habits propel you forward in your dreams or hold you back. Do you want to dig deeper and create successful habits to live a deep, rich, meaningful life? Join me for a complimentary session. 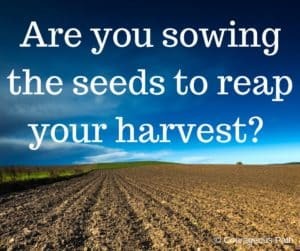 Are You Sowing the Seeds to Reap the Harvest? With Spring equinox upon us, the flowers and trees are budding and ready to burst into bloom. Yet, we forget the process of blooming doesn’t happen in a vacuum. First, the seeds are planted or spread amongst the wind. Second, the plants are nourished in the soil. And, third, the seeds soak up rain fall and moisture in the soil. Our dreams come to fruition in a similar manner. When we think of our dreams and aspirations, they are merely seeds. It’s an idea of what we want life to look like or experience. Our dreams do not grow into reality unless they receive nourishment through attention and action. And, it’s the right type of nourishment that’s key. It’s about attention and action that’s fully aligned to the dream. Distractions are saying to your dream, it’s okay, you’re not important to me right now. (Wow, that’s a reality check!). Would you go put acid on a growing plant? Probably not. Yet how often, do we let other “things” get in the way? Way too often, right? Consider water as our support system to nourish our dreams. Dreams don’t become reality in isolation. How many people know the dreams you’re pursuing? If no one knows, you’re likely not getting the support you need to bring your amazing dream to fruition. Too often, we’re afraid to tell people our dreams. 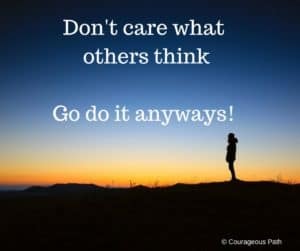 What will others think? How will we be perceived? It doesn’t matter what they think. Your dream is all about YOU! By sharing with others what you want to accomplish, you create buy-in for others to support you. And, usually this happens in miraculously ways you never even thought of. Don’t let your dream be just a dream. Go after it! Turn your dream into reality! Seeds are planted months before you reap the harvest. Now is the time to properly nourish your dream, gain support in pursuing the dream. This, in turns, that allows you to reap your harvest. What big goal are you going after this year? What are you doing to nourish that dream? Who knows about your dream and supports you? Together we can make your dreams become reality. PM me for a complimentary session. Yesterday, I was craving some deep stretching. My hips were tight and my shoulder barely engaged. I threw on some workout clothes and a jacket and headed to the yoga studio yesterday. In the locker room, I found a locker and put my wallet, phone, and shoes in. I took off my jacket to realize – in horror – that I only had my sports bra on. What!?!? I whispered to myself, I don’t have another shirt to cover my upper body. EEEEK! I recently gained a few pounds and was completely self-conscious of my appearance and slight belly. Yikes! What do I do? I drew out two solutions. I can go home and skip the class. Or, I could completely careless and focus on my own objectives – take the yoga class. I took a deep breath and chose to walk into the yoga studio. How much time do you waste wondering what other people think about you? If you should do this or do that instead? Do you waste time by sitting on a decision for days, months, years until you get a sign from someone else on what to do? Why do we ask other people’s opinions versus just going with our instinct? Think about where in your life you give power to others. If you want to take some time back in your life and free up your mind, stop giving people choice over your direction. For more tips on taking your time back, PM me for a complimentary strategy session. This past Sunday the Oscars made headlines with a memorable mistake. The wrong winner was announced for a highly coveted Oscar. There was criticism galore. While I agreed this was a big mistake, I thought how dare anyone criticize them. It’s a bit self-righteousness. I thought – haven’t you ever made a mistake in your life?